Last week, we did something that Joe absolutely dreads doing every fall: We put the grill away for the year. But before we put it away, we said goodbye to the grilled foods of summer in style: with gorgeous T-bone steaks, velvety baked potatoes, grilled banana sundaes (I'll share the recipe tomorrow), and these vegetables. This vegetable medley, a mixture of zucchini, mushrooms, pearl onions and garlic, is one of our favorite pairings for steak during the summer months. It's a delicious side dish, and equally as yummy piled directly on top of the steaks themselves. The vegetables are already rich and earthy, but the Worcestershire sauce really adds something special and makes them unbelievably flavorful. You could absolutely cook the vegetables on the grill in foil packets, but I like the caramelization they get in a saute pan. 1. Melt butter in a saute pan over medium heat. 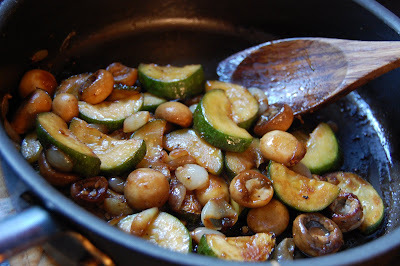 Add zucchini, mushrooms, and onions and cook until vegetables are tender. Add garlic, salt and pepper to taste, and red pepper flakes; cook and stir one minute. 2. Add Worcestershire sauce to vegetables. Reduce heat to low and cook until the sauce thickens and coats the vegetables. You put the grill away? My family must not be normal then, we grill all winter long...LOL! I take that back, the men grill all winter long. This looks so amazingly tempting it's not even funny!